SAMARA, March 21. /TASS/. 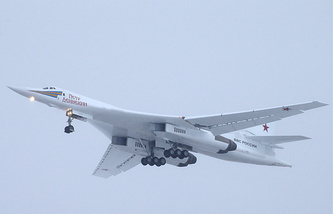 The entire fleet of Tupolev Tu-160 supersonic strategic missile-carrying bombers with new weapons is expected to be renewed by 2030, Russian Deputy Defense Minister Yuri Borisov said on Wednesday. "We are going to purchase the entire fleet of our strategic Tu-160 bombers in their new version and carry out heavy upgrade of operational aircraft where only the fuselage will remain while all the onboard radio-electronic equipment and engines will be replaced. That is why, we will get the renewed fleet of strategic aircraft somewhere by 2030," Borisov said during his visit to the Samara-based Kuznetsov Enterprise, which produces engines for long-range aviation. According to the deputy defense minister, the new Tu-160 will be less visible than its predecessor "due to special coatings." "Alongside, we are developing new airborne weapons, and you can’t compare the Tu-160 plane with the Kh-55, Kh-550 and even Kh-101 missiles and the plane, which we hope to get serial-produced by the 2030s with new airborne weapons that will have quite different ranges," Borisov said.